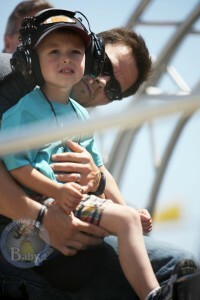 Mark Wahlberg and son Michael enjoyed the day at Long Beach today watching the Toyota Grand Prix. The 85 lap race, which capped off a weekend of celebrity racing/promotional events was won by Ryan Hunter-Reay. During an event yesterday, Mark told reporters that being able to ride in an Indy Car allowed him to fulfil his childhood fantasies. 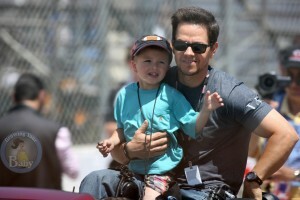 He also served as Grand Marshal for today’s race.